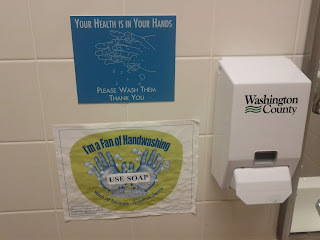 (winkyboy): How much does it cost to wash your hands? How much does it cost to wash your hands? As much as I appreciate the concern for the public to maintain cleanliness, seeing printouts and plaques like this just makes me shudder - and it should do that to you, too. In the same way that we don't think about how many plastic bottles the world goes through every time we crack open a new Evian, we don't consider how much society pays for little (oft-ignored!) messages like this. Notice in the corner of the printout there's a little note saying "Sponsored by the Minnesota Departments of Health and Agriculture and the Food Safety Partnership of Minnesota"? And notice that "Please Post" on the printout, too? That means that some (in this case, multiple) government agencies were paid to design, develop, and distribute these items to public restrooms everywhere. There will probably be no way I would ever be able to know how much it cost... but paper printings just by themselves are costly. On top of that, there's the plastic plaque - and those are definitely not cheap. The government is not your mom, and should not be paid to act like it.